Here are a few Organic tips you can use to control pests in your yard. I will be posting these often, so stay tuned. You will also notice that I will only be making two posts weekly as I have noticed that readers are choosing certain days to catch up. Today we are going to talk about Nematodes and Diatomaceous Earth. Both can be purchased at the Natural Garden or Barton Springs nursery. Parasitic Nematodes need to be applied in the evening and watered in well. These are living creatures who eat the harmful bugs in your soil. There are also harmful nematodes in your soil already like the Golden Root Knot Nematode, but the one you will be applying is friendly. The nematode will control fleas and Fire Ants as well. Nematodes need to be applied when the soil is about 60-65 degrees, so get busy as soon as the weather allows. Another option for dealing with pests in your soil is Diatomaceous Earth. This is ground remains of a freshwater algae called Diatoms. These are spread out in a dry powder form and used to control Snails, Slugs, Earwigs, Thrips and Aphids. You can use this on plants and the ground and it is suggested that it be applied in the morning hours. It kills by piercing the body parts of the passers by, or by ingestion, which punctures the internal organs of the pests. Very important when handling this product that you wear gloves and a face mask at all times and be sure to apply on a still day with very little to no wind and when you aren’t expecting rain or irrigation to be an issue. Unlike the Nematodes, this is most effective when left dry for a bit.. Begin to educate yourself on the benefits of Organic Gardening you will soon find that the reward is great, not only for body, but for mind as well. Plant of the Day: Society Garlic – This is an evergreen grass that grows about 2×2 that does well in full sun or filtered light. It has a strong garlic scent and produces tall spikes with clusters of Lavender flowers. Very hardy, low water plant. Can you please tell me if diatomaceous earth is harmful to good bugs as well? We have had a terrible time with all sorts of bad bugs in our garden this year & I want to avoid this w/my fall crops & next spring. Thanks! These are the insect that are affected by DE; Ants, fire ants, caterpillars, cut worms, army worms, fleas, ticks, cockroaches, snails, spiders, termites, scorpions, silverfish, lice, mites, flies, centipedes, earwigs, slugs, aphids, Japanese beetles (grub stage), bed bugs, fruit flies, corn earworm, cucumber beetles, corn borer, sting bugs, squash vine borers, thrips, loopers, etc., etc. Yes. A nematode is a nematode. They will ingest it, crawl over it, and it cuts through like microscopic glass particles. Food grade is placed in seed storage facilities to dehydrate bugs from eating and reproducing in warehouses. Some people have mentioned that they eat a teaspoon a day to rid themselves of parasites. Breathing it in small amounts and having it on our hands is not all that problematic. Stands to reason, if you think of all the other gunk we breathe in, even microscopic parasites that ride the dust in our houses and air we breathe every day. Use some common sense. I am just curious as to why it is important to wear gloves and a face mask when handling Diatomaceous powder, and if it is dangerous to your health in any way if it does come in contact with your skin or lungs? Adam, it is important to wear gloves and a mask because if the material enters your lungs it can be damaging. Diatomaceous Earth is made of siliceous sedimentary rock crushed into tiny particles. The reason this works on certain bugs is because it basically like crawling through tiny shards of glass. Obviously you wouldn’t want to breath that. Great Question, Thanks for asking! Will the DE kill the Nematodes? Should the Nematodes be applied a period of time before applying DE? We have ticks and fleas in the yard and I don’t want to use chemicals that will harm our pets or our herbs and vegetables. I’d like to use both methods if they can be used together. I just wanted to add that the Diatomaceous Earth has to be food grade (not the kind used in pool filters, which is dangerous to animals and humans). I double up duct tape so that both sides are sticky, sprinkle DE on one side and stick it in our windowsills. It has really helped lessen the amount of stink bugs that get into the house. If it gets wet you need to remove and make new tape to apply. One of the cheapest places to get food grade DE is at a feed supply store. From what I have read it will not kill the beneficial nematodes but will kill the harmful ones. Good point about the food grade DE and where to locate it, Thank you for pointing that out! I have never read anything that suggests that Diatomaceous Earth can kill the beneficial nematodes or bees. Neil is the problem in your house or outside? How long will it take for the nematodes to kill the ants. Also what can I do if anything to create an environment where the good nematodes stay and I do not have to apply yearly? Leslie, i’m not real sure abuot the aunts but I would say right away as they begin to eat and continue to do so until it is too hot outside. They cannot survive in high heat but will die off once they have eaten the pests anyway. Can I apply Nematodes for the bad guys underground, then apply DE to get the above ground? … or will the DE kill the nematodes? Kelly, you should not use them at the same time. DE can harm the Nematodes. 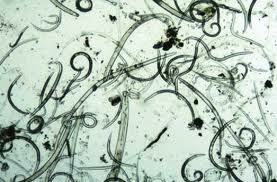 You should also not fertilize for a few weeks after you apply the Nematodes. On 7/16/2013 you commented to someone that they could use the nematodes and DE at the same time and then in this comment you say not to use them together – so which is correct? Thanks. Thank you for cathching that. When the question was posed originally I could not find contrary information. Since then every other article says something else. I would say not to mix them.